If we are willing to learn from history that state or government endorsed religions work against the growth and prosperity of society, we might see, as the founders did, how it eventually leads to its deterioration. BOSTON – Lately, we hear more and more about how our Founding Fathers were all Christian, God-fearing men and how America is a Christian country. But, was it intended to be? According to Rev. Sarah Carpenter’s findings, the answer is no. The research Rev. Carpenter presents in Freedom of Religion by Individual Choice attempts to define the word ‘religion’ as it is used in the First Amendment. The debate continues as to whether the nation was created by and for Christians or was meant for people of all faiths and beliefs. Rev. Carpenter attempts to end this dispute by examining history and the events surrounding the Founding Fathers and how they were affected them. “Only by hearing their own words can we really know what the Founding Fathers envisioned as they expressed their ideas and opinions about the impact of religion when it’s interwoven in politics and government,” Rev. Carpenter said. Rev. Carpenter believes that religion and religious beliefs are core values for many Americans and that many feel threatened if their beliefs are challenged in any way. 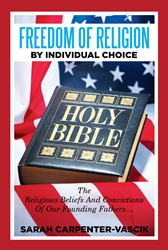 In her new book Freedom of Religion by Individual Choice, Rev. Carpenter makes strong arguments as to why each religion should not only be tolerated but also respected equally in the United States. “If we are willing to learn from history that state or government endorsed religions work against the growth and prosperity of society, we might see, as the founders did, how it eventually leads to its deterioration,” Rev. Carpenter said. For more information, visit http://www.religionforall.com. Rev. Sarah Carpenter was ordained in 1996 and holds a bachelor’s degree in religion and philosophy. She received a master’s degree in biblical studies in 2000 and was awarded a doctorate in New Testament studies in 2006. Her study of theology was in addition to her career in engineering. Rev. Carpenter recently retired from University of Vermont in Burlington, Vermont after a 35-year career in clinical engineering and is currently living in Massachusetts.